There’s no doubt that aging is a difficult transition. There are a number of things you might be worrying about, but your brain and memory are likely at the top of your list. Cognitive decline doesn’t have to be inevitable. Hearing aids and engaged communication can be optimal defenses against cognitive decline, isolation and depression. The results of a recent French study that lasted a quarter of a century and followed 3,700 individuals aged 65 and over showed that people who experienced hearing loss were more likely to experience steep cognitive decline. Those who opted to use a hearing aid, however, did not experience the same rapid decline. 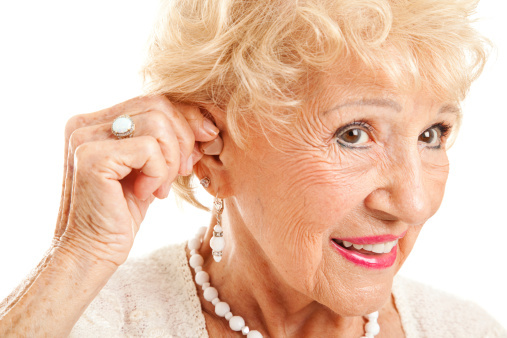 About 30% of individuals age 65 and older experience some degree of hearing loss. That number increases to 70-90% by the time people are over the age of 85. There are certain things that can lead to hearing decline, including exposure to loud sounds. This could include working at a construction site, working at an airport, listening to loud music or simply being exposed to loud noises. Loud environments can damage your ears so that it becomes increasingly difficult to hear accurately over time. Most people may first notice some hearing degradation when they struggle to hear people in a room with subtle background noise. For example, let’s say you’re at your neighborhood coffee shop or chatting with a friend at a party and you’re having a really hard time hearing your friend. Yes, you might attribute this to the background noise—other conversations nearby, music, etc.—but if it never used to be a problem but it is now, it shows that your hearing is getting worse. When it gets to the point that you’re having trouble hearing your television or making sense of what people are saying around you, the condition is worsening. Pay attention to the cues of others. If you’re constantly being told to turn down the television or radio because the music is too loud, it might be a sign that your hearing is deteriorating. If you notice people might be talking to you less because they don’t think you’re listening, it might also be a warning sign. Your ability to hear plays a major role in your quality of life and overall safety. It keeps you engaged with your friends, family and community, and it keeps your brain active and engaged. The study I mentioned earlier clearly indicates how hearing impacts cognitive skills, depression and other areas of mental health. The research team learned that people who experienced hearing loss and refused to use a hearing aid also experienced more severe declines in cognitive ability—especially when compared to those who didn’t lose their hearing or who decided to combat hearing loss with a hearing aid. When you can’t hear, it is very difficult to stay engaged. People experiencing hearing problems often don’t admit their struggles because they don’t want to bother others, don’t want to be treated differently or don’t want to admit they have a problem. Instead of dealing with the problem or informing others, they slowly begin to isolate themselves. This can lead to depression and further accelerate cognitive decline. When it comes to hearing, much like other health problems, suffering in silence often does far more harm than good. Staying away from others and avoiding communication is the worst way to deal with difficulty hearing. This, in fact, can create a vicious cycle that can lead to isolation and depression. Here’s how it works: when somebody can’t hear as well, they are less likely to engage in conversation. And if they do, they might miss out on information that can lead to isolation. The lack of engagement and fear of communication as a result of one’s inability to properly hear can ultimately lead to isolation. Stand face-to-face: If you think you’re hearing is fading, talk to people while looking directly at them. So although you might not hear every word, you can follow their lips and watch their facial expressions. This will keep you engaged and help you follow what they are saying. When you talk to somebody you can’t see head on, you lose the ability to track these valuable cues. Ask people to speak clearly: If you don’t understand somebody the first time around, ask them to speak a little more slowly and clearly so you can follow. Do it especially with family and friends, as these relationships are especially important to maintain as a way of seeking daily engagement. Limit background noise: When you’re talking to others, eliminate distractions that can make it more difficult to hear. Turn off the television or music when you’re talking to somebody to help you get the most from the conversation. Stay engaged: If you notice your hearing is going, don’t let it pull you away from relationships and other things you enjoy. Staying active and engaged can fight off cognitive decline and depression. Get a hearing device: Book an appointment with your doctor to be fitted for a hearing aid device. They can help keep your brain functioning optimally, battle depression and isolation and help you get more satisfaction out of your interests and relationships. Fight off cognitive decline and keep depression at bay by paying attention to your hearing. A hearing aid can keep you happy and engaged, and should definitely be considered if your hearing is wavering. “Hearing aids may slow mental decline in hard-of-hearing elderly,” CBC News web site, last updated November 5, 2015; http://www.cbc.ca/news/health/hearing-loss-cognitive-1.3305819, last accessed November 9, 2015. McCullough, D., “We must tackle the stigma of age-related hearing loss,” Nursing Times web site, November 2, 2015; http://www.nursingtimes.net/break-time/practice-comment/we-must-tackle-the-stigma-of-age-related-hearing-loss/5091580.article. Jaret, P., “Hearing Loss: Tips to improve communication,” WebMD web site, http://www.webmd.com/healthy-aging/features/complementary-hearing-loss-strategies, last accessed November 9, 2015.